This election has left me wondering at what point do we just stop trying to have presidential debates. Does anyone say anything of value? Does anyone actually pitch a detailed plan about how to move America forward? All I see is a platform to speak about catch phrases and political attacks. Politicians often talk more about their opponents’ faults than their own qualifications. I’m not going to just blame the politicians. A lot of this is our fault. Our as in me and you – the journalist and the reader/viewer. You don’t care to listen or read it, so we don’t care to present it to you. Bernie Sanders is a socialist. (Well at least we are consistent, because isn’t Obama supposed to be a Communist?) Donald Trump is a racist. Hillary Clinton is a liar and an elitist. Ted Cruz (apparently has an ugly wife) and is a womanizer. That’s all most of us know about this election. And the fault, dear Brutus is not in our stars, But in ourselves, that we are underlings… said a wise political assassin a long time ago. It’s easier to follow the election this way, and make a decision based on Twitter feeds. Because it essentially absolves us of all responsibility from the actions of our newly appointed leader. Because we can then say with honesty that we didn’t know any better. 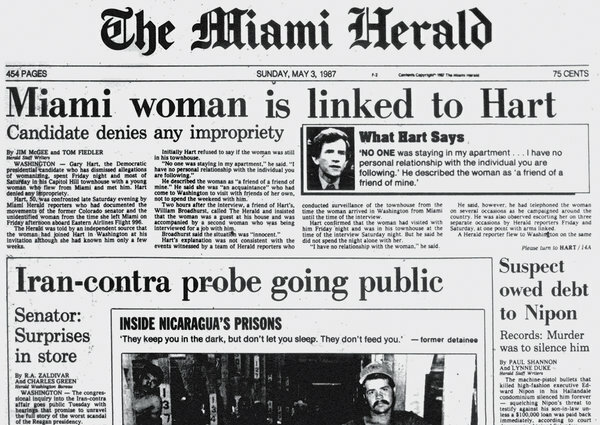 While smear campaigns have existed since Jefferson and Adams turned on each other, the first one I remember as a child was Gary Hart. The following column by Yahoo columnist Matt Bai, Are We Getting The Leaders We Deserve, had me thinking about Hart, and his infamous speech that has been forgotten about. I was a kid when his scandal hit. I didn’t know anything about him except that he apparently had an affair with a younger woman. This apparently disqualified him from running the United States of America. His speech was supposed to be one that reeked in shame and begged for forgiveness. Instead, the true nature of the speech may have predicted the shenanigans of upcoming Presidential races. I’ll leave it to you to see if his theories ring true. Sadly, his speech was lambasted by the press, because he asked for some media accountability. The public fired back, stating to nearly every national outlet in polls that he had been treated unfairly and that his infidelity should not have been the focus of the media coverage – because frankly, aside from his wife and family – who cares? Apparently, the media didn’t listen. I take a lot of pride in an industry that holds its own to standards. The media is one of those fortunate businesses that can criticize those of its own who are not holding up their end, unlike so many other professions who are chained to their unions. Yet this time, we dropped the ball big time, and we can’t be ashamed to admit it. Front page stories – clearly in order of importance. Personally, I can care less whether a politician has inhaled. Or cheated on his or her wife. Or any of the other nonsense. The President’s job is not one of a choir boy. Let’s top pretending we need to elect one. The nature of the coverage presented by the media, and craved by audiences, is now a four year loop of pointless scandals that decide who is be the leader of the greatest country in the world. You deserve to have better information presented to you. We should be doing better in our coverage. We deserve to be writing and presenting better stories. You owe it to us to demand more and not be making decisions based on Saturday Night Live sketches.